Are you afraid you do not have what it takes to perform a task? Do you often shy away from new responsibilities at work because you don’t feel you are worthy? Are you afraid of speaking up in a meeting fearing what others will think or say about you? Fear can be a powerful feeling both at the workplace and in life. Some fears are logical, while others are irrational. Take an accountant, for example, if one does not have practical accounting skills, they could fear being fired or remaining in the same position for years on end. As a result, the accountant can join a course, such as the practical accounting course to advance their skills and career. Other fears, such as the fear of failure, can cost your career advancement goals. Fear can keep you stagnated at your current position, or even keep you from getting your dream job. What are the greatest fears plaguing professionals and job seekers in the market today, and how can you overcome them? Doubting yourself is one of the ways to sabotage your career goals. When you doubt yourself, you feel as though you’re unworthy or don’t deserve the goals you have set. Comments made by your colleagues in gest or light notes could further your self- doubt. For instance, if someone says, “You’ll never do that,” it could make you feel as though you do not deserve what you truly want to get. How should you overcome self-doubt? One of the most effective ways to overcome self-doubt is by affirming yourself. Whenever you feel unworthy of doing something, affirm yourself and take action. If you shy away from voicing your ideas in a meeting, next time, push yourself into speaking. This will not only get rid of doubt, it will also show your colleagues a different, more abrasive side of you. Some people doubt self when they compare themselves with others. Let your accomplishments be measured by their own merit and not as a comparison to other peoples. A popular saying goes, “If you have never failed, you have never tried.” While the saying is true, some of the colleagues I have interacted with over the years are held back by fear. “What if I fail?” is a common scenario that many workers think about before starting out a task. Unfortunately, being guided by fear can lead you to underperform at your job as you’re not ready to take the risks that could lead to failure. When you look at some of the most successful people in the country, you’ll notice a trend of failures that eventually led to success. The former Prime Minister, Raila Amolo Odinga is a good example. Despite failing to get the presidential seat severally, he never quit or gave up. He has never let the fear of failure stop him from running again. Although he hasn’t gotten to the presidential seat, he has managed to gather a devout following unlike any other politician in the region. If you wish to advance in your career, you will need to root out any fears of failure. Only by trying -and failing, can you know what works and use it to propel your career. It’s quite natural to be afraid of change. Ideally, professionals work till they get into a comfortable spot where they can enjoy their work, and still be successful in their roles. Unfortunately, this ‘sweet spot’ will only keep you stagnated at your current position. There is comfort in sticking with what you’re familiar with, unfortunately, if you only stick to what you’re familiar with, you’ll not grow into new opportunities. If you wish to excel in your career, you need to fight your way out of the comfort zone. While the change could be worrisome, it is the only way to grow. You can, however, manage the amount of change happening around your workplace. Years back, I had a colleague who could not do anything he wasn’t perfectly sure of. Then one day, he told me he wanted to change that narrative. He started out with coming to work half an hour earlier, then, he started getting more work done, and his career started growing. Now, he’s a General Manager in one of the leading banks in Kenya. He changed one thing, but the effect rippled through his entire career. You don’t have to start with a drastic change, you can start with a small change and scale it as you go. Ultimately, you’ll realize overcoming fears –irrational or not, is not easy. You have to constantly remind yourself you can do it, and keep your focus on the end goal. While getting over these fears won’t be easy, the alternative of staying in the same position for years is more worrisome. Unsure where your career is headed? Why don’t you consult one of our career coaches! The one on one sessions will help you look at your professional past, where you currently are, and where you would like to be in the future. What other fears do you think could keep you from advancing? I have been applying for jobs but no invitation to interview please help me understand where the problem is. There are a few factors that could hinder you from being called in for an interview. The most common is the state of your CV. 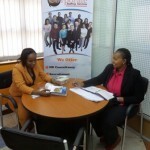 Perhaps you can visit our offices for a more comprehensive report, or call us at 0722 735 216. Such an amaizing extract, I must say, indeed fear is the foundation of all failures; But had rather try and fail. Well stipulated with practical and realistic examples of real work environment. I have enjoyed reading the article.